I heard them last night. It was dusk and I was in my backyard watering the garden when the calls of wild geese rang out overhead with predictable October familiarity. I paused, mid-spray, turning my gaze skyward, squinting in the fading light toward the sound. There they were–flying south in their unmistakable “V” formation, heralding the arrival of fall. Despite our indian summer temperatures last week, the weather is starting to behave more appropriately for the season. There is a chill in the morning air that tells me it’s time to raid my closet for sweaters. Ready or not, the inevitable countdown to Halloween, the gateway of the holiday season, has begun. Time to “fallify” the house, as my friend Lisa says. 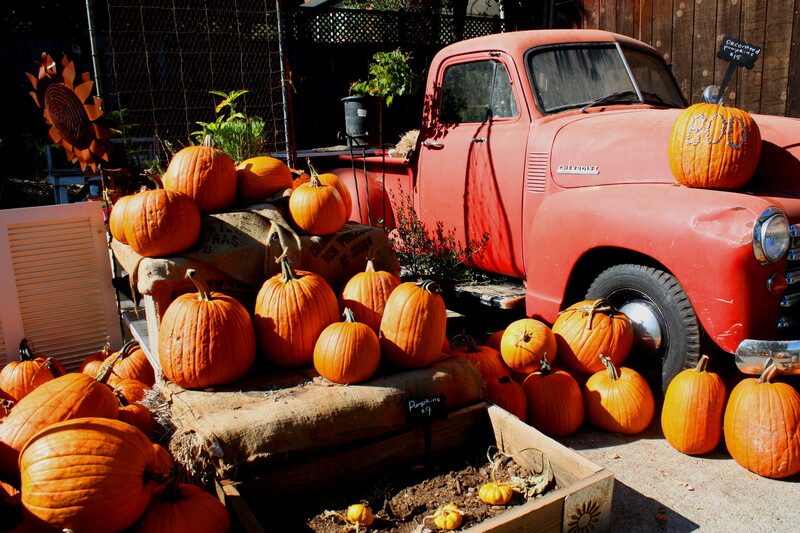 That means garlands of harvest leaves, dried corn stalks, acorns, hay bales, and, of course, pumpkins. 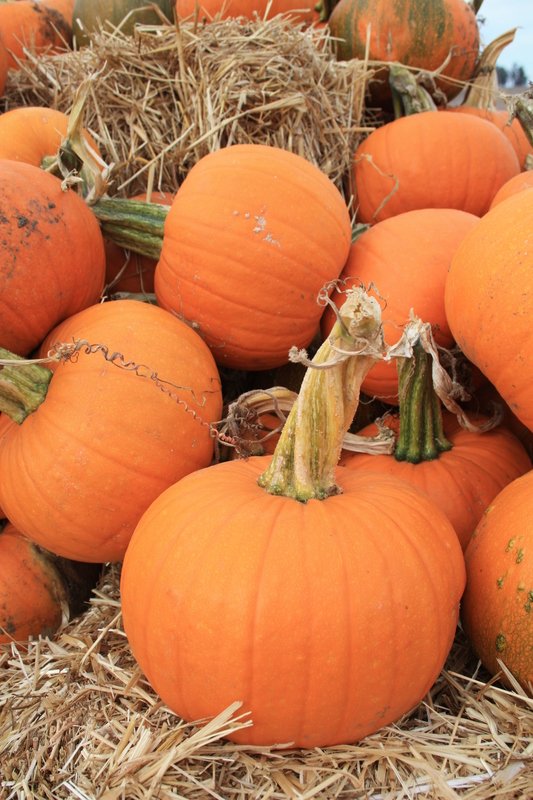 Orange, white, yellow, green, Cinderella, Fairytale, round, squat, smooth, or dimpled with warts–there is a pumpkin to suit every decorator’s eye. But pumpkins are so much more than just porch decor or carved vessels that hold flickering candles. They are food–a characteristic we sometimes overlook. Last year this realization hit me like a ton of bricks as I noted local green cans stuffed with perfectly edible, intact pumpkins after the holiday. Perhaps writing about local farm to table has raised the bar of my awareness to a new level, but it occurred to me that Cinderella’s mojo wasn’t making it to the masses. Waste is a terrible thing. Food waste is criminal. Although we live in one of the wealthiest counties in our nation, there are families in our own community that struggle with hunger. From a global perspective, imagine looking at ourselves through the eyes of a third world country–seeing edible food on display at our homes casually tossed aside as garbage without a second thought. You would shake your head in disbelief! This year I invite you to adopt a new, more conscious view of your fall decor pumpkins. Eat them! If they remain intact they are still perfectly usable. In addition to being low in calories, pumpkin is high in vitamin A, beta-carotene, and minerals like magnesium and potassium. The roasted flesh is ideal for soup, pie filling, ice cream, or side dishes. Bake the seeds tossed with olive oil and some seasonings for a healthful snack. I’ve included a couple of favorite recipes to inspire your imagination. If you simply don’t have the time to bake, consider this: Chef Susan Lustenberger of White Rose Ranch has made the following offer—Marin County residents can drop-off intact pumpkins and other home-grown surplus produce (apples, citrus, veggies etc.) at her storefront, located at 902 Grant Avenue, around the corner from Sentimental Journey in downtown Novato, from 4:30-6:00pm Tuesday through Friday, in exchange for a coupon worth $5 off the meal order of your choice. Collected produce will be donated to Project Abundance, a teen-community service project that gleans useable surplus food for local families in need. 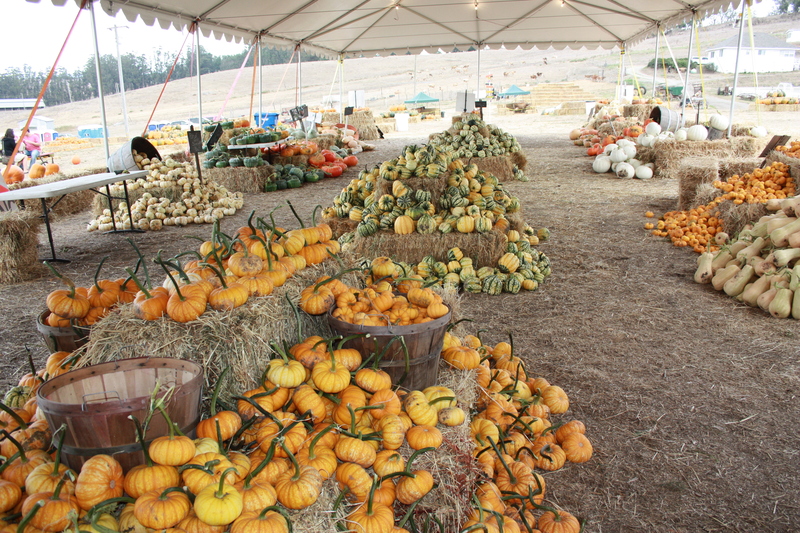 If you’re looking for the best family friendly places to buy locally grown pumpkins, I recommend the following two farms that are guaranteed to deliver an authentic experience: Farm Girl Nursery at 100 Pacheco Avenue in Novato, open Saturdays from 10:00AM-2:00PM, has a variety of reasonably priced traditional pumpkins to choose from as well as a large you-pick garden plot, goats, chickens, rabbits, horses, and pot-bellied pigs to visit. Admission is free with purchase, or a minimum $5 donation is requested for touring the farm grounds and visiting the animals. It’s a great local outing! 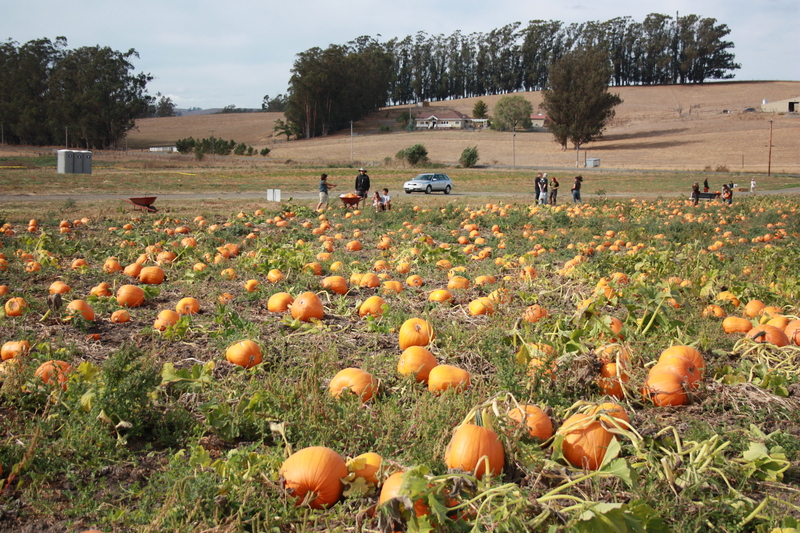 If you don’t mind a 30 minute drive, check out Spring Hill Farm’s Great Peter Pumpkin Patch, located at 4235 Spring Hill Road off Bodega Highway, eight miles west of Petaluma near the small town of Two Rock. 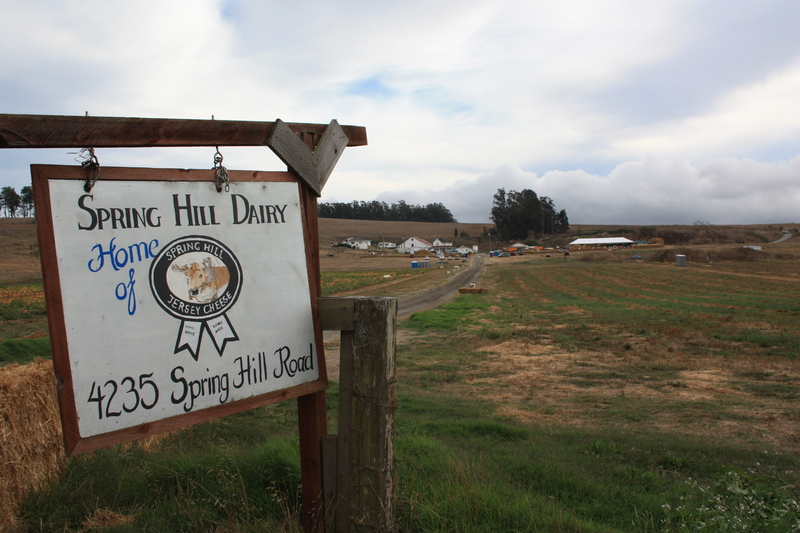 This three-hundred acre certified organic dairy farm is a great place to pick your own pumpkins from the field, dig for organic potatoes, milk a cow, ride on a tractor-pulled hay wagon, eat homemade pumpkin ice cream, and taste award-winning jersey cow cheeses–all with free admission and parking! Open seven days a week through October 31st, from 9:00AM until dusk. Wear comfortable, casual clothing and shoes or rubber boots that don’t mind some dirt. 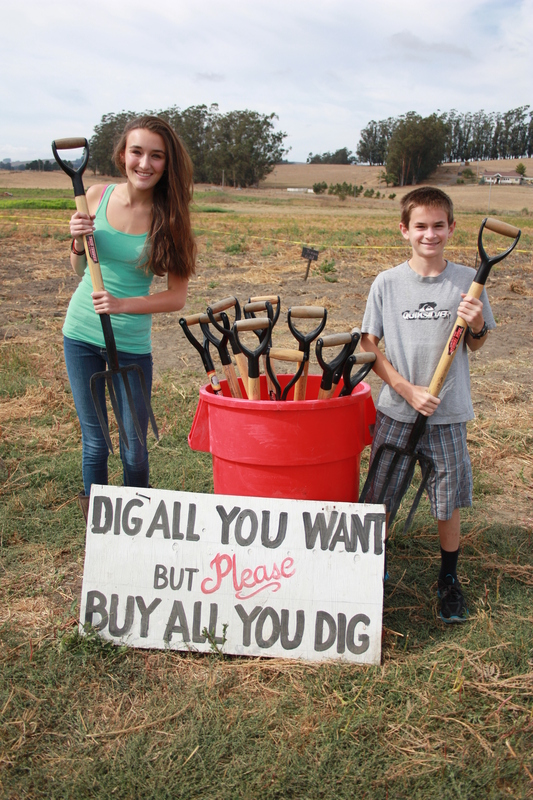 You can also schedule an educational tour for your group or school by calling 707-762-3446 to make a reservation. Wherever you get your pumpkins this year, try these delicious ways to enjoy them once you’ve finished admiring their festive facades. Mangia! * A two-pound pumpkin yields 1 1/2 to 2 cups purée. Freezes well. Cut pumpkin in half. Scoop out seeds and set aside to roast later. Lightly rub flesh of pumpkin with vegetable oil and place, cut side down, on a rimmed baking sheet coated with cooking spray. Bake at 375 until very soft when pierced, 50-70 minutes. Remove from oven and let cool. Scoop flesh into a food processor and whirl until smooth. Whisk all ingredients except gingersnaps and bourbon in a bowl until blended. Pour into an ice cream maker and process according to manufacturer’s directions. Scrape ice cream into a bowl and stir in gingersnaps and bourbon (if desired). Cover and freeze for about 2 1/2 hours, then scoop and enjoy! 1. Follow above directions for roasting pumpkin, but cut cooked flesh into chunks instead of pureeing. 2. Melt butter in a large pan. Sauté onion, carrot, celery, and garlic until translucent, approximately 10 minutes. 3. Add stock, pumpkin chunks, and sautéed vegetables to a large soup pot. Bring to a boil, then reduce heat and simmer 30 minutes. 4. Stir in brown sugar, spices, and maple syrup; remove from heat. 5. Stir in heavy cream. Taste and adjust seasonings. 6. Blend mixture with a hand blender, food processor, or blender until smooth. Serve topped with a drizzle of sour cream and chopped chives if desired.